Pinwheels are dazzling and delightful. They remind us of simple times of childhood play where an easy breeze can create a symphony of colors. We’ve all been hypnotized by the movement of a pinwheel and it’s so fun to bring that movement into our quilts. But there’s nothing worse than seeing a misaligned point in your pinwheel quilt! Trust us, we know! For the past couple of weeks, we created a sweet low-volume Indian Hatchet baby quilt. And during that process, we ended up with 480 half square triangle units! So what to do with all those units? We created a pillow (join our email list to get our pdf pillow tutorial). But that only made a small dent in our HST stash! That led us to… a pinwheel quilt! Or at least some variation of it! A pinwheel spins when your points line up perfectly and your pinwheels give that illusion of movement. A non-spinning pinwheel is one where the points misaligned and no matter how much you squint, that pinwheel seems broken. After making 100+ of these things, we’ve gotten really good at getting our pinwheels to “spin” and we wanted to show you the techniques we used. So how do you get your pinwheels to “spin”? Four HST’s. Our HST’s are 2 ½” unfinished (and trimmed), but you can use any size. The key is to make sure your HST is perfectly square, pressed well (we press ours open, but you can press to the side) and that the diagonal seam goes corner to corner. If your HST is not square, or you’ve got a little wonky pressing, you may end up with an off-kilter pinwheel! With 480 HST’s, we may have gotten a little dizzy and mixed up every once in a while and that’s ok. Goes with the territory. Join Top 2 Units with a ¼” seam. Join Bottom 2 Units with a ¼” seam. The trick is to use a straight pin to join your seams. Sew 1/4″ seam to join the HST’s and make sure your seam goes right at that pin mark. Option 2: Press Top 2-Patch seam to the right; Press Bottom 2-Patch seam to the left and nest. As much as we tried, we couldn’t get our unit to lay flat. Time to Line Those 2-Patch Units Up! Right sides together, line up your 2 units, carefully matching those center seams. Use a straight pin to pin through the center seam of the top unit and through the center seam of the bottom unit. This pin will ensure your points line up. We prefer to pin down the two ends to avoid slippage. 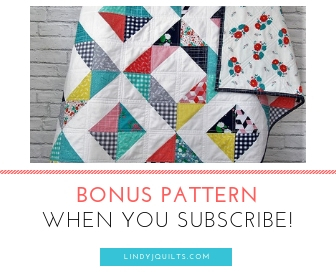 You can bypass this step if you’re on your quilting game! Sew ¼” and when you get to that center seam where all the points meet, slow down and make sure you are sewing directly over that point. Open up your 4-Patch Pinwheel, check your points, and if it’s all good – press that seam. You should have yourself a pinwheel that spins! When your good your good, right? At least that’s what we tell ourselves when our points match up and our pinwheels spin… You have to give yourself encouragement when you’re sewing 480 HST’s into pinwheels!!! We hope you liked our Pinwheel tutorial! Do you have any “point-matching” tricks you use on your quilts? Subscribe to our list and tell us all about them! So it’s back to finishing up our Pinwheel Quilt over here in Lindy J Quilts Land. Hope we don’t get too dizzy seeing these pinwheels whirl and spin!